Without explaining where the financing would come from, including scarce affordable housing subsidies, Atlantic Yards developer Bruce Ratner today declares that the project would be complete in 2018, promising a 10-year timetable little different from that announced when the project was approved in 2006, albeit after a pause for delay. Ratner, in a Daily News op-ed headlined Atlantic Yards dead? Dream on, does not mention the recently-revealed news that the State Funding Agreement gives him 6+ years to build the arena and 12+ years to build the five towers of Phase 1, both after the close of litigation and the delivery of property by eminent domain. Nor did he mention that the City Funding Agreement allows him to build a much smaller Phase 1 than that anticipated in the Empire State Development Corporation's (ESDC) General Project Plan. Indeed, Ratner identifies Phase 1 as an office tower and three residential towers, leading to the conclusion that four rather than five towers would be built--despite a later assertion that "all" of Atlantic Yards would be built. So the project appears to be downsized a bit. That means that, while it's possible that work could be sped up or that the arena could open with an adjacent bridge closed, it's not a good bet. Nor does he address the acknowledgements by project supporters that the buildout could last decades. Just this week, Joe Chan of the Downtown Brooklyn Partnership told the Observer, "The Atlantic Yards was always a project that was conceived as taking a few economic cycles to fully realize itself." Nor does he address the recent claim, by Chuck Ratner, an executive of parent Forest City Enterprises, that "we still need more" subsidies. The announcement puts yesterday's counter-protest in greater perspective, as part of a coordinated effort to show support for the project. 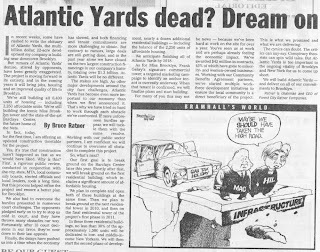 The headline on the op-ed was a direct rebuke to the Brooklyn Paper's overblown Atlantic Yards Dead headline. That was published after Ratner, in a front-page 3/21/08 New York Times article, acknowledged that the project stalled and indicated that the arena was moving ahead, but said the economy “may hold up the office building... And the bond market may slow the pace of the residential buildings." Today's op-ed was accompanied by a brief news story in the Daily News (p. 8), attributed to two reporters, headlined (online) Ratner vows to break ground on Atlantic Yards. The article, which included excerpts from the op-ed, contained no countervailing evidence nor any questions for Ratner. Perhaps such a no-actual-reporting article was negotiated as part of the placement of an exclusive op-ed. Either way, it suggests that the Daily News, rather than the New York Times, has become Ratner's new outlet of choice. 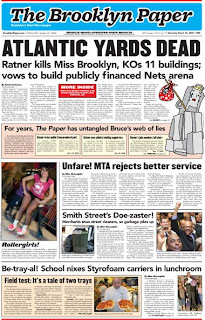 Remember, Ratner chose the 7/5/05 Times for an exclusive look at new designs for the project, and the Times, on 9/5/06, was leaked and then overplayed the favorable-to-Ratner news that the project would be reduced 6% to 8%. Now, however, architectural critic Nicolai Ouroussoff, at least, has turned against the project, urging architect Frank Gehry to walk away. Ratner does mention Gehry in today's op-ed, but only in the context of Miss Brooklyn, "Frank Gehry's signature commercial tower." Could that mean that Gehry may be working only on the arena and a small portion of the project, as Ratner has tried to lower our architectural expectations? Also note that Ratner describes AY as a "multi-billion dollar" development, no longer attaching a $4 billion price tag. Given that the cost of the arena has already ballooned by 50%, adding more than $300 million to the tab, that might have been prudent. However, elected officials surely would like some more precision. In recent weeks, some have rushed to write the obituary of Atlantic Yards, the multi-billion dollar, 22-acre development my company is building near downtown Brooklyn. But rumors of Atlantic Yards' demise, stirred by opponents, have been greatly exaggerated. The project is moving forward in its entirety, and in the coming years it will bring jobs, housing and an improved quality of life to Brooklyn. We're still building all 6,400 units of housing - including 2,250 affordable units. We're still building the iconic Miss Brooklyn tower and the state-of-the-art Barclays Center, the future home of the Nets. In fact, today, for the first time, I am offering an updated construction timetable for the project. Ratner's statement ignores the fact the project, shepherded by the ESDC, bypassed formal local input, and even project supporters like former Deputy Mayor for Economic Development Dan Doctoroff think, in retrospect, that it should've gone through the city's Uniform Land Use Review Procedure, or ULURP. Also, given the filing Wednesday of a new lawsuit, "their last appeals" is no longer accurate. Finally, the delays have pushed us into a time when the economy has slowed, and both financing and tenant commitments are more challenging to obtain. But contrary to rumors, large deals are still getting done, and in the past year alone we have closed on the two largest construction financings in our company's history, totaling over $1.3 billion. Atlantic Yards will be no different. A key (but relatively small) component of that financing was tax-exempt Liberty Bonds, aimed to revive Lower Manhattan. Such bonds are obviously not available for this project. Forest City Ratner has shown it can compete for scarce affordable housing financing, as shown in the development of 80 DeKalb Avenue. That doesn't mean, however, that it can get AY funded, and it's time for city officials to clarify what funding is, in fact, available. The stakes are high. As other major developments around the city face challenges, Atlantic Yards has become even more important to our economy than when we first announced it. That's why we have tried so hard to work through each obstacle we've confronted. If more unforeseen hurdles appear, we will tackle them with the same resolve. Working with our public sector partners, I am confident we will continue to overcome all obstacles to complete this project. Does "working with our public sector partners" simply mean defense against lawsuits or does it mean a request for additional subsidies? Our first goal is to break ground on the Barclays Center later this year. Shortly after that, we will break ground on the first residential building, which includes a significant amount of affordable housing. We plan to complete and open both of these buildings at the same time. Then we plan to break ground on the next residential tower in 2010, and then on the final residential tower of the project's first phase in 2011. In these three residential buildings, no less than 30% of the approximately 1,500 units will be dedicated to low- and middle-income New Yorkers. We will then start the second phase of development, nearly a dozen additional residential buildings - including the balance of the 2,250 units of affordable housing. Three residential buildings and an office tower in Phase 1? That suggests one building has been eliminated. Also, note that Phase 1 was supposed to have 2110 residential units, not 1500. We anticipate finishing all of Atlantic Yards by 2018. Note the use of the weasel word "anticipate," rather than something more firm. Remember, Chuck Ratner told investment analysts last year, "As you know, in our business, these things take a very long time, most often, frankly, longer than we anticipate." As for Miss Brooklyn, Frank Gehry's signature commercial tower, a targeted marketing campaign to identify an anchor tenant is currently underway. When that tenant is confirmed, we will finalize plans and start building. He doesn't respond to criticism that the developer is, according to the Times, essentially cold-calling potential tenants. For many of you this may not be news - because we've been hard at work on the site for over a year. You've seen us at work and are perhaps already feeling the economic impact. We've awarded $42 million in contracts, 45% of which have gone to minority- and women-owned businesses. Working with our Community Benefits Agreement partners, we've started multiple work-force development initiatives to ensure the local community is a direct beneficiary of the project. This is what we promised and what we are delivering. Of course, more than $42 million has already been delivered in public subsidies. The cynics can doubt. The critics can nay-say. Conspiracy theorists can spin wild tales. But Atlantic Yards is too important to the ongoing vitality of Brooklyn and New York for us to come up short. We will build Atlantic Yards - and deliver on all of our commitments to Brooklyn. If Ratner's so confident, he should hold a news conference and answer some of the hard questions. Barclays Center to open December 31, 2010? At today's rally, one voice, and then? On eminent domain, Paterson channels.... Gargano?